It seems these days that the majority of mainstream media websites on both sides of the Atlantic, whether print or television based, have littered their online design with icons begging users to Digg this, StumbleUpon that, let people know they've Reddit, or describe it as Fark. I wanted to know whether adding this rash of buttons actually drives the audience to bookmark and share content, or whether users do it based on the strength of the content and news brand, irrespective of whether the buttons are present. To that end, this summer I've carried out a major statistical study into the success of mainstream media content on social bookmarking and link sharing services. For a month, between July 15th and August 14th, I automatically took half-hourly snapshots of the front or 'popular' pages of Delicious, Digg, Fark, Mixx, Newsvine, Reddit, StumbleUpon and Yahoo! Buzz. 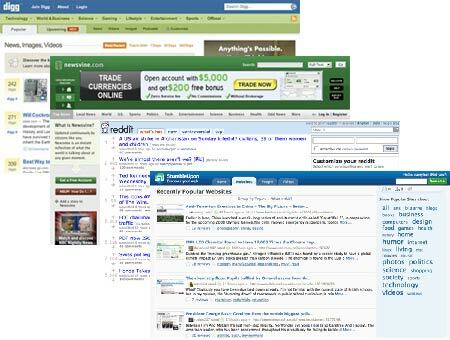 I then extracted from those snapshots all the URLs that appeared from a selection of over 50 mainstream media websites. From the 3,500+ URLs I captured, I've been able to see exactly which media sources have proved popular on each social bookmarking service. The URLs I looked for included 24 hour news stations like CNN and the BBC, and a range of British and American newspapers. I'll be presenting the results during the next couple few weeks. I wanted, though, to start by looking at British newspaper websites. 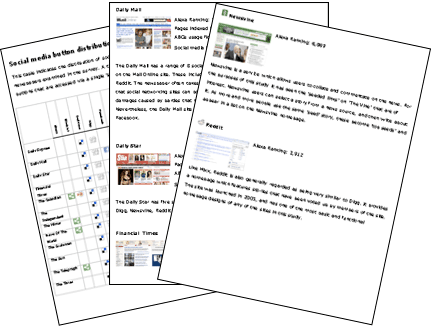 I have produced a PDF 'e-book' called "Measuring UK newspaper success with social media". The study looks at 901 stories, from 12 British newspapers, that became popular across 8 social media networks during July and August. 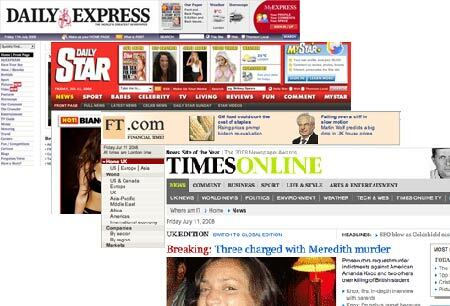 It features information on the performance of the Daily Express, Daily Mail, Daily Star, Financial Times, The Guardian, The Independent, The Mirror, News Of The World, The Scotsman, The Sun, The Telegraph and The Times. And, in a break from my usual practice here on currybetdotnet, instead of spreading the results over a series of blog posts, "Measuring UK newspaper success with social media" is a one-off paid for download, costing £25. For your money, you get a 59 page report that comes in at just under 10,000 words, with a statistical breakdown of exactly how each newspaper performed on each of the 8 services. The distribution of social media buttons is compared to the results, and there is analysis of which stories became popular during the course of the month. The report also examines the individual URLs that became popular across two or more link sharing services. If you are interested to see the type of analysis contained in the e-book, over the next three weeks I'll be using the same data to blog about the performance of television channels and 24 hour news stations. I'll also be looking at the impact made on social media sites by some local and free newspaper content, starting tomorrow with the Metro. This is one of a series of posts based on a statistical survey of social media sites carried out in July-August 2008. By Martin Belam on 15 September 2008. That's clever. I hope you make some sales. Interesting to see the crossover between users of old and new media. in euro 2008, Telegraaf created a game that allowed users to guess who would win a match. they then did a similar thing during the Beijing Olympics, incorporating editorial content, including blogs from the newspaper's journalists that were reporting from the games. The games and content were promoted on both websites and in the newspaper, with the intention of driving more traffic to Telegraph.nl. Martin, this is excellent work. A great idea. I would hope to see that people are using the internet to make their own news and that we may finally get to see, one day, people actually really telling each other how they feel about the world. Instead of the emotive prejudicial propaganda that is the media today. It does seem the worst offenders are indeed media that use our English language. So, it would be interesting to view with your significant research - how many of these stories are actually copied or reused news feeds from AYP and reuters? Then after that is taken into account - what is the remaining paparazzi addition to these figures. I think you would then very sadly have accounted for 99% of the days news. Sad Zombies. Imitate, imitate, replicate, replicate, stagnate.